Topping out at just 8.8 ounces, GrandPrø Tennis was born from a simple ethos: everything you need, and nothing you don’t. We’ve eliminated all of the unnecessary weight of traditional court shoes without ever sacrificing the Grand.ØS principles of flexibility, cushioning, and ergonomics. The result? A shockingly light shoe you have to feel to believe. Textile covered footbed for comfort and breathability. EVA outsole with Grand.ØS technology. *Weight based on men’s leather court shoe in size 8.5 and may vary based on style, materials and size. Awesome show, super comfy and light weight. Overall a nice casual shoe, wish it were a bit wider. Cole Haan is my go to shoe for 15+ years, simply because of high quality, good looks, and their 9 1/2 EEE is a perfect fit for me. A "wide" in this shoe is just a tad narrow for me, but the leather is flexible enough and toe box is broad enough overall to allow the leather to stretch enough after about a week to be comfortable. It's been about 6 weeks now and they are quickly becoming my favorite casual shoe. Very lightweight and easy wearing. I love the shoes. They are so light I can barely feel them on me. Love the color and I wear them with anything. Love unique color and fit. PERFECT! I WOULD HIGHLY RECOMMEND! This is my second pair. I went with "Wide" on this pair just to give a little extra room. These are my everyday "shoes". The originals and the new. Like walking on air; Uber light and comfortable! I really like this shoe. It is very light and comfortable. There are lots of this style of shoe out there today, but the CH has all the support for your foot alot of the others don't. My new favorite casual shoe and I will probably order it in another color as well. Great look, great feel. They work very well without socks! These shoes look, feel and fit much better than I anticipated. It’s been great, and I would definitely recommend them to anyone. Run a little large. Overall handsome shoe that can be worn with just about everything in your closet. This just a amazing shoe if you are thinking of buying plz do. my only complaint is the price its a little high but you can see the quality and time put in. These are superior sneakers!! The shoes deliver an amazing experience right at out the box, with so much refinement, and personality. I was looking for something casual for a dressy office, and I don't think there is a better deal than this. Thanks Cole Haan for building such a great product!! I am always satisfied, no complaints! I have been wearing this brand since 1988. Initially, I purchased the shoe because it was a popular brand. I wore that shoe for 20 years and re-soled once. on one of the shores, the stitching of the front side and top has a tuck in it that shouldn't be there. My husband wore them in the house for a couple of hours, and removed them because of a discomfort. There was a red area on his foot that came from the rubbing of the tuck, which is actually a bump. If the shoes had not been so expensive, we would have tried to cut the stitching error out. However, I ordered another pair, and sent the "seconds" back. Hopefully, the next pair will be perfect. And, I will not have to pay for shipping again. I did have to pay for return shipping. Fresh! Great look and feel in time for the summer. The GrandPro is a super lightweight sneaker that is versatile given its style and simplicity. So far (I've probably worn 20 times) it is wearing quite well, too. I AM A VERY FEMINIE FEMALE AND PURCHASED THIS SNEAKER. MY REASONING WAS THE COLOR WHICH THEY DO NOT OFFER IN LADIES. I GOT THE SIZE SEVEN IN MEN'S. THE SNEAKER FITS TRUE TO SIZE. IT IS NOT A BULKY SNEAKER SO IT NICE AN SLEEK ON MY FOOT. THE WEIGHT OF THE SNEAKER IS SO LIGHT WEIGHT THAT ITS A PLEASURE TO WEAR. YOU KNOW I'M IN LOVE WITH THE COLOR.THE STYLE FITS MY STYLE IN A SNEAKER.I'M SO GLAD I WENT AHEAD AND PURCHASED THIS SNEAKER NOW I'M WONDERING IF ALL MY THOUSANDS OF SHOE ARE WORTH WEARING. Looks very good! Versatile fashion weaponry! Very light. I had to get a half size bigger than I normally wear. The hand stain on the Woodbury color adds character, but my pair had a bit of stain on the white sole area. Not so much that I'd return though. 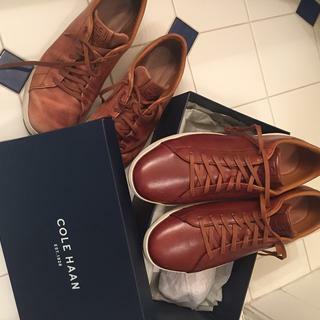 I bought a few pairs of Cole Haan in a couple of months: Men's Pinch Hand-Stained Weekender,MEN'S GRANDPRØ TENNIS SNEAKER( British Tan, Dark grey),Kelson Penny Driver,Kelson Venetian Driver. All of them are very comfortable and I love the style too. It is my favorite brand. Great. Casual shoe. Have received several compliments, including from guys in the gym and even from my barber! note shoe run a bit long but not in width so probably best to buy true to size. Love these shoes. Excellent fit. Stylish comfortable. I'm going to purchase a few more pairs!!! I have wide feet, and these shoes come in wide widths. They are very comfortable. I've been wearing them with shorts or chinos this summer without socks, and they look great. I've gotten many compliments. From a size perspective, I had to order a half size larger than I normally wear with Cole Haan shoes. My old man loves them so much. Thanks a lot, Cole Haan! Husband liked the style but the shoe was to tight. Returned that size and requested an exchange for a larger size. I love this shoe so much I want some more in different colors! Of course, I love Cole Haan shoes. They are the only shoe I have owned that does not need that "break in period" as in most shoes. They last and wear and wear. I am a "shoe freak" as I have not met a pair of shoes I own that I did not fall in love. Cole Haan's are my weakness. In addition to more shoes, Cole Haan has two bags I want. I bought these shoes on a recent trip. I wanted something like a tennis shoes but still a little dressy. Although, it is a man's shoe. I was instantly in love with the color. I think it's a slight bit wider in the toe but you would have to be super close to see it or have the female shoe right beside it. I LOVE THEM. Great shoe that I love to wear. I am buying the exact same pair for my son. Gift for my husband, who has wanted these for a while. Will be a nice surprise for him! The style is modern but at the same time maintains a classic look. Love the color!! I bought these because they go great with jeans or shorts. Very versatile and give your clothes a look that's between casual and dressy. I really like the style and the reviews are very good on this shoe. Loved these so much I bought a second pair! great shoe and love the color. coming into Fall and it goes with so many things. They are for my son, he claims they are the most comfortable leather shoes he has ever worn, so now, he is ready for another pair. Wanted a sneaker that was high-quality and was a a brown/cognac color and my birthday is coming up. Because I have the stitch light version of the shoe and love its comfort. My husband saw them in a store and wanted them to update his shoe wardrobe. Bought my first pair which was gray. Love them so much I wanted a second pair and wanted brown to match some other clothing I have. Can't wait! I need a comfortable shoe for work. This looks like it would be comfortable for walking and standing. Also like the color brown! My husband loves these shoes he has them in every color. It looks awesome. And Cole Haan makes great products. I have a pair of the high tops and loved them. It looks very comfortable and yet does not look very casual. Saw them on TV and on other men. Very good looking tennis shoe. I chose these because they are comfortable, casual, but at the same time professional. I can dress them up or down. looks casual, comfi, but at the same time dressy and prepy, very cool! My second pair. Great shoe. Incredibly comfortable. Stylish for dress casual professionals. Great with jeans or cotton slacks. Can you play tennis in these? BEST ANSWER: No, I would not recommend you play tennis in these, strictly a style shoe. 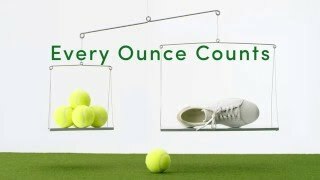 Tennis sneakers should have much more bulk and arch support. No, they are not recommended as a playing shoe. Which color of polish will match the Woodbury Handstain? BEST ANSWER: I would buy the "neutral" polish at Cole Haan. It won't change the color of the shoe, but will polish them for you. I think a neutral creme Polish would be the best choice. BEST ANSWER: We accept any unworn merchandise purchased at www.colehaan.com within 30 days of purchase. 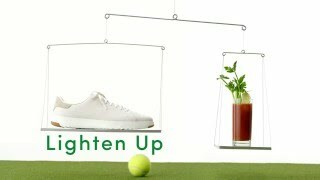 You can also return colehaan.com purchases at any Cole Haan retail store. For more info, click on the Returns link at the bottom of any web page. Are these good for walking long periods of time? Such as walking around cities in Europe? BEST ANSWER: I love these shoes, however I took a pair to Dublin for a week last year and would not doing it again. Great shoe for a day but not for a trip filled with walking. They are not good for walking a few hours much less several hours. They need more cushion and arch support. What is the best way to clean the sole? BEST ANSWER: Cole Haan sells the Grand sole cleaner that works great. It should just be used only on the sole. It works great! I use Mr. Clean Magic Eraser on all my white soles. Haven't had to clean these yet. Are the leather sneakers safe to wear in the rain or do they need a protective coating? BEST ANSWER: No leather footwear is ever happy to be wet, but if your leather GrandPros do get wet, allow to dry completely away from heat. Using a cedar shoe tree will help to absorb moisture and retain the shape of the shoe. Finally, apply leather conditioner to restore softness. They will get wet but in my experience with various pairs, they did not leave water marks after they dried. BEST ANSWER: In most of our footwear, the insole is not designed to be removable and is usually permanently secured to the foot bed of the shoe. Sorry - our footwear is not designed to accommodate orthotics. The sole does not seem to be removable. Nonetheless, the shoe is comfortable. I’m size 9.5 in sneakers (nike, adidas) but, size 9 in zerogrand. Which size would best fit me? BEST ANSWER: I wear a 10.5 nike sneaker, and went with a 10.5 grandpro. It was a good fit. What material is lining made from? 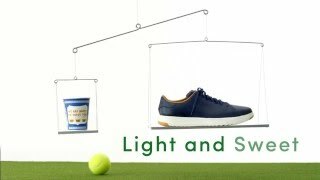 Which is best way to use leather protector spray on tennis sneakers? Spray evenly on leather, or spray and apply with a cloth? BEST ANSWER: Spray evenly on leather, let it sit and dry for best results. need to order a couple pair of replacement shoestrings...how ? Where can I get an extra shoelace? Is this made with full grain leather? BEST ANSWER: Yes, the GrandPro Tennis sneaker has full grain leather uppers. Does the women's grandpro tennis sneaker come in wide widths? If not, can I get the men's? I wear a size 8 or 8.5 women. BEST ANSWER: The Women's GrandPro Tennis styles are available in B or Medium width only. If you choose a men's style, it will be wider all over and especially in the heel. Women's equivalent of Men's size 8 would be Men's 6.5, depending upon the shape of your foot. What is the difference in the $130 Grand Pro Sneakers and the ones for $150? BEST ANSWER: There is no difference in fit or design; the only difference is that the hand-stained colors require a bit more attention to detail in the coloration process of the leather. White does not require this additional hand coloring.